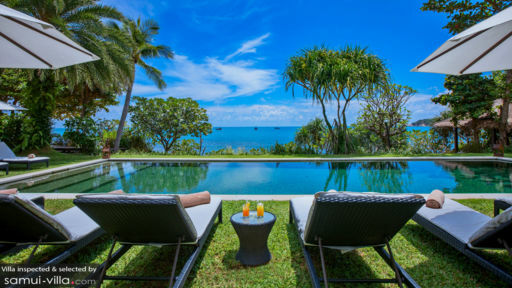 Sangsuri Villa 2 is one of three villas at Sangsuri Estate in Chaweng, Samui which is an exciting tourist destination. The villa has seven bedrooms spread across different levels and pavilions around the main living and outdoor spaces. There are activities for guests on the property including yoga studio, a pull-out projector in the garden, and two swimming pools. There are bars, dining areas, and show-kitchens for guests to make use of at their own leisure. Besides the seven bedrooms, there is a dormitory just for kids as it is furnished with bunk beds! The seven bedrooms and one dormitory are spread around the property in separate pavilions or located over the reception. The master bedroom has one of the best views of the ocean and is furnished with a comfortable king bed. The room is air-conditioned and is one of the largest rooms on the property. The other bedrooms are air-conditioned and are furnished with king beds or twin bed, with direct access to the garden or the pool. They all offer excellent views. The dormitory has six beds perfect for children where they can enjoy together as a group playing with toys and simply relishing their time. All the bedrooms are equipped with en-suite bathrooms that come with all necessary amenities. 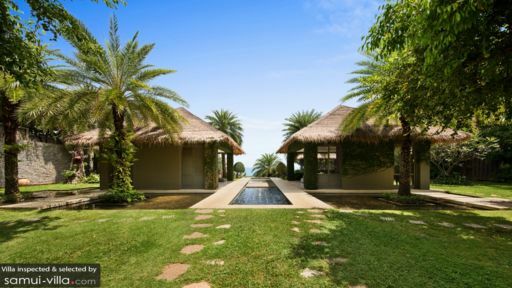 The villa is facing the ocean and thus offering direct beach access to guests of villas. There is the ocean lying in the distance as you can lounge in the infinity pool on the first level and take in the views as much as you wish. There are sun chairs, sofas, and rattan chairs for guests, as well as alfresco dining. You have the beach level, with the main swimming pool, a Jacuzzi, and a covered barbecue area. 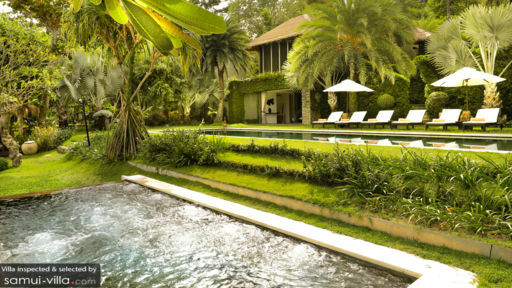 The villa even has a pull-out projector for guests to enjoy an outdoor cinema experience. A massage sala is where you can indulge in house massages and spa treatments exclusively for you. A beach deck facing the ocean is furnished with lounge chairs and sunbeds for a comfortable place from where you look out at the water without a care in the world. The living areas at Sangsuri Villa are located on the two main levels, i.e. beach level and pool level and both levels have indoor and outdoor living pavilions. There are separate pavilions for dining and bar/kitchen. The living areas are well-furnished with comfortable sofas and armchairs, the large windows and glass doors open out to the swimming pool and you will find that the living areas are well-lit, as well as ventilated for the duration of the day. The dining area can accommodate all the guests on the two tables, and the bars are fully-stocked. The kitchen showcases a resort-style layout with abundant amenities and appliances for guests’ use. The outdoor living areas are furnished with sunbeds and lounge daybeds plus there are several stone sculptures that celebrate Thai heritage. Lush greenery is abounding around all of these individual spaces. As part of a luxury estate, Sangsuri Villa 2 has excellent staff and services that are being offered to guests of the villa. There is a massage sala where guests can indulge in personal therapies, the house chef can prepare excellent meals for you. They can arrange for a BBQ, outdoor movies, garden parties and even make arrangements for island excursions. Chaweng beach is home to a variety of restaurants and bars along with Choeng Mon beach which is a more laid-back and easygoing beach. There is the Choeng Mon beach Night Market perfect for finding steals and eating local street food!